In the movie Interstellar (2014), directed by Christopher Nolan, there is a scene present towards the ending that depicts the universe and all within it (at least in the 5th dimension), as a library. 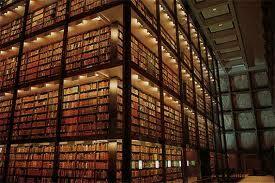 This too is an endless library with floors upon floors of books. The protagonist eventually finds his house amongst all the various shelves and somehow through space and time, sends a message to his younger self and daughter just in time. I chose this specific example as I feel it was quite a coincidence that I have actually seen an “endless” library, even though it was in a movie. The interstellar library, a tesseract in the 5th dimension.